The cast of TVB detective comedy drama The Ghetto-Fabulous Lady <褔爾摩師奶> held a large-scale promotional event on Sunday to talk about the upcoming show, which premieres in Hong Kong on Monday, February 25. 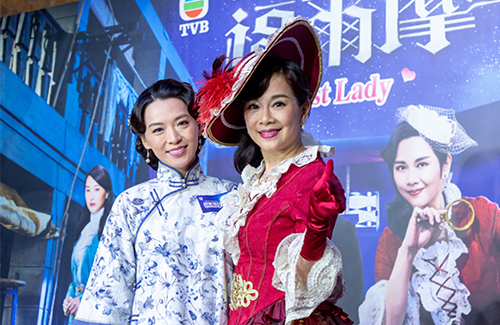 The period drama stars Adia Chan (陳松伶), her first television drama since 2017’s The No-No Girl <全職沒女>, with Ben Wong (黃智賢), Alice Chan (陳煒), Tsui Wing (徐榮), Kaman Kong (江嘉敏), Jeannie Chan (陳瀅), and Dickson Yu (余德丞). Set in early 1920’s Colonial Hong Kong, The Ghetto-Fabulous Lady follows Judy Fletcher (Adia Chan), wife of the wealthy Sir Philip Fletcher (Brian Thomas Burrell), a Hong Kong government official. Born into a poor family, Judy’s goal in life has always been to marry rich and obtain wealth. She mingles with socializes to escape property, but once she achieves that goal, a series of events leads her to fall right back into the bottom. After her husband’s mysterious disappearance, Judy learns to cope with her new identity and transforms into a female Sherlock Holmes, solving mysterious around the city. Ben Wong plays Kwan Yat-fu, Judy’s trusted butler who acts as her bodyguard and protector. On the hardships of filming The Ghetto-Fabulous Lady, Adia said, “There are hardships to any job, but the worst has to be when you don’t have a bathroom around the area. Adia Chan – Just the face alone is scary enough? lol…Alice Chan looks so good next to her. I liked Adia back then but I don’t remember her as comedic star. She was more of the sweet, gentle girlfriend. But my memory may be foggy because it has been so long. @jimmyszeto It makes no sense. Alice should play the lead. She has the talent to do this sort of comedic role. Adia was lovely, but she also wasn’t an acting powerhouse. Was she that popular to be a draw for this series? @jimmyszeto I remember Cold Blood Warm Heart and I liked her in that and some other series. At the time, she (or perhaps her character) was better than the raw Jessica but still was not as stand out like Esther Kwan, to me. TVB is definitely lacking in young actors. All of their stars, from Ruco to Kenneth to Nancy Wu to Alice Chan are mature. All these actors have talent, but they need younger stars. It isn’t like the old days where they develop them from supporting to main. Fresh to them is getting Shaun Tam to join. It’s very short sighted and limiting. @jimmyszeto To be fair, alot of their young actors aren’t very good. Sitcoms can give them some more experience but some actors get too comfortable in sitcoms and stay there for longer than they should. Sitcoms should be used as a springboard. Still rather give a youngster a chance than miscast a 40 odd year old as a teenager trying to act innocent and cute….